Brilliant Advice’s to People Who Wish to Follow Isolated Opinions of Scholars – By Shaykh Muhammad Awwamah. 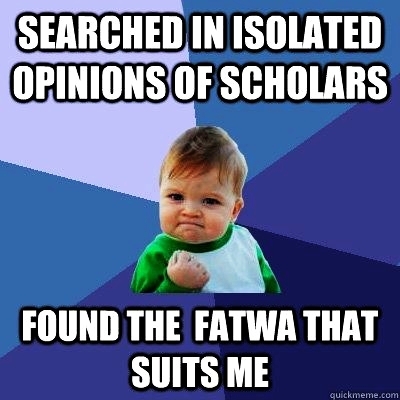 The Internet – that amazing super thing through the help of which you are reading this has among the many positives its done has also exposed laymen to a multitude of opinions of scholars on fiqh (jurisprudential matters in Islam) leading them to pick and choose fatwas, for example, on music, even though however isolated, however far they may be from the majority, agreeing opinions of the bulk of the scholars. Remember, all this is almost always to cater to the whims and fancies of the nafs (self) and not to follow the religion in its entirety (which needs to be the goal)…leading them to their own detriment. Detriment? Read on to know why. Categories: Advices, General | Tags: Fiqh, Isolated opinions of Scholars, Jamah, Majority opinions vs Minority opinions, Shaykh Muhammad Awwamah | Permalink.